Well, I’ve been very busy since I last wrote. Remember I said about being interviewed by an American lady for Nature Centre Magazine? Here is the link to the article, I’m really pleased with it! Mummy has been working in Barbados and she got a photo of the lovely little noisy Whistling Frog that lives there. I think their latin name is “Eleutherodactylus johnstonei.” but I’m not 100% sure, maybe Andrew might know! Mummy had just rescued this one from the swimming pool. She had to give him a bath in rain water to get rid of the chlorine. He was ok and hopped off later. I’ve also just got back from Disneyland Paris. There was a restaurant there called Rainforest Cafe there which had lots of frogs and animals in it. We had lunch there one day and I managed to persuade Daddy to buy me a cuddly red eyed tree frog named Cha Cha! He’s really snuggly. When we woke up on our last day there it had snowed. We took this photo of a statue of Cha Cha covered in snow as I think it’s the only time you’ll get to see a frog looking this cold and still smiling! I’ve written Part 1 of a story called ‘One Frog’s Dream’ which I will share with you soon. See you back here next time! It’s been very exciting since my last blog. I have been to the London Aquarium and saw some amazing creatures. I fed some sting rays and got to see some lovely penguins. The seahorses were good too. We even saw some humungous vegetarian piranhas who splashed us when they got fed with carrots! 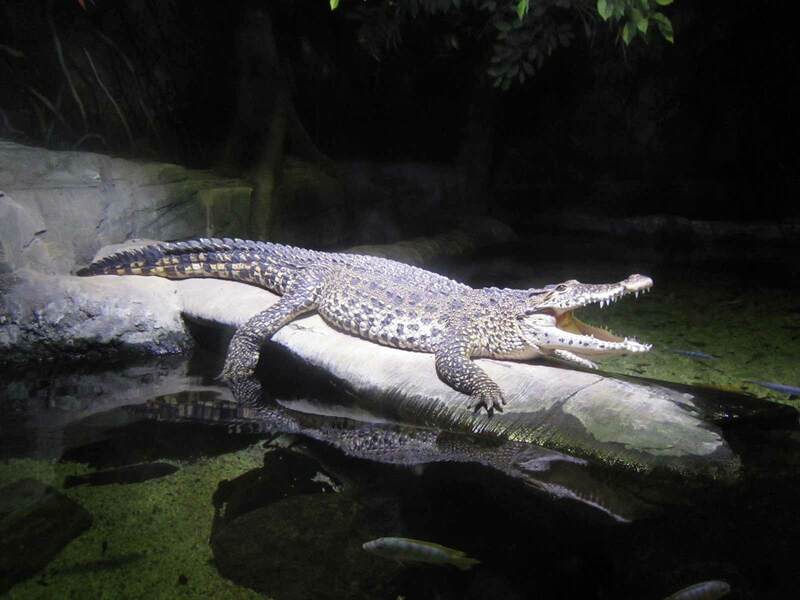 One of my favourites was the Cuban Crocodile which is highly endangered. It was lying down in a warm spot with its mouth open. It looked artificial because it was staying so still. It had its mouth open to keep cool. I was so excited when a lady from America asked to interview me for Nature Centre Magazine. She asked me all about my experiences with nature and what I like about it. I will let you know when it is published so you can have a look. It was really nice to get some comments on my first blog from people, some I knew and some I had never heard of before. It made me feel happy to make new friends from my blog! I have painted a special painting of a frog for this Christmas Blog, I hope you like it. Wishing you a Merry Christmas, see you back here in 2013. Hello, my name is Millie Jo Hearsey, I’m 8 years old and I live in Calvert Green, Buckinghamshire. When I was little I always really liked frogs and got lots of books, toys, games, anything ‘froggy’! I love to read about frogs, make model frogs, write stories about them and make activity books about them too. One of my frog stories is called ‘Grass Snake’s Tale’ which had Frog Police and an Evil Toad in the story. It was made into a library book by my teacher at school. There’s even a copy up in my class room for people to read when they’ve finished their work. I will be sharing some of my frog stories with you here. Last Christmas my Mummy & Daddy sponsored a Red Eyed Leaf Frog for me. I have a lovely photo of him up in my bedroom. I was so excited to sponsor my very own frog. 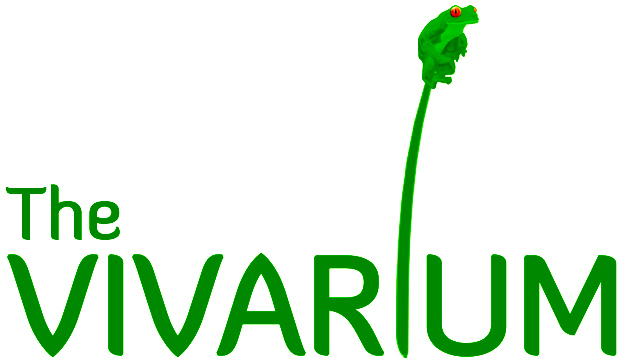 In November I went to see the Vivarium at Manchester Museum and got to hold my frog. I felt really calm when he looked at me right in the eye, I really loved him. Andrew Gray was very kind to show me round the Vivarium and he let me hold lots of frogs and other beautiful creatures. I was really proud to hold so many different animals. It was so special, I told all of my friends and my teacher about it in class. It was one of the best days of my life and I’ll never forget it. I have a massive frog display in my bedroom that covers the whole of the top of the bookshelf. I’ve asked Father Christmas for some more to add to the shelf! My Nanny & Grandad live in Barbados with lots of lots of frogs in their garden. I will try to get some video of them to show you – they keep you awake at night time because of their loud croaking, we call them Bleeping Frogs! There is a Cane Toad that likes to do lots of poos on their patio – we call him ‘Poo Machine’! He’s very cute but I’m not sure my Nanny & Grandad agree. I will be sharing lots of photos of frog things with you and telling you my frog stories. I hope other children who like frogs will like my blog! I will take a look at your blog as soon as I leave this message. It is wonderful that you are willing to share your interest in frogs with us. Hello, Millie. My name is Emma Springfield. I write articles for Nature Center Magazine. Occasionally I interview people who have interesting blogs about nature. Andrew knows who I am. Please ask your parents if I can interview you for our magazine. Then if you are interested email me at emma@nc-mag.com. I hope to hear from you soon. Dear Millie, I love your frog collection, especially as my favourite colour is green! The tree frog in the picture is really cute. Merry Christmas to you and your family, Millie. What a wonderful trip you had. Hi Millie, hope you and all the family had a great Christmas! I’ve just returned from Costa Rica where I have been since New Year. I wanted to say congratulations on appearing in Nature Centre Magazine http://www.nc-mag.com/2013/01/a-nature-walk-with-millies-frog-blog.html , and to let you know you’ve had 140 visitors following your blog page, which is wonderful. Hope we hear more from you soon!